Often times when an individual thinks they’d be a great candidate for some type of facial rejuvenation surgery, they immediately think of popular procedures like a facelift, rhinoplasty, or forehead lift in Charlotte. While these are excellent treatments for the right individual, a procedure often forgotten about that can address some of the biggest facial aging concerns including sagging skin and volume loss is called a cheek lift. In this blog, I’d like to let my patients know a little bit more about the different types of non-invasive and surgical procedures that can help restore natural youth back to your face and cheeks. Facial fillers are an ideal treatment for patients who want to restore facial volume to their cheeks without ever undergoing any type of surgery. Fillers like Juvéderm, Restylane, and Sculptra can provide patients with a subtle lift while also promoting new collagen growth. Facial fillers can also be a great way for patients to try out a new look before seeking a more permanent procedure like cheek implants. 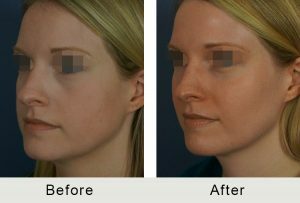 Much like facial fillers, fat grafting is a treatment that I perform in Charlotte that replaces lost volume to the face and cheeks. However, fat grafting is a completely natural procedure, as I’m able to take fat from another area of your body (often times the stomach) and add it to your cheeks to provide an organic and long lasting lift. Fat grafting is a very popular treatment for facial volume restoration because there is low risk of infection and rejection since the injectable material is from the patient. Because Charlotte fat grafting uses live tissue, the results last longer than the non-surgical treatments. A permanent solution to achieve fuller cheeks is with cheek implants. Cheek implants provide patients with a lift and can add significant volume to the area. Cheek implants are ideal for patients that have weak cheekbones. The negative aspect of cheek implants is their slight increased risk of infection compared to the other treatment modalities. No matter what stage of the aging process you’re in, I’m confident that I’ll be able to address your concerns and develop a plan to revitalize your cheeks. For more information about undergoing facial fillers, fat grafting, or cheek implants in Charlotte, please contact my medical practice today by calling (704) 842-3644 to schedule your initial consultation. During that time, I’ll be able to determine which type of cheek improving procedure you’d benefit from most and come up with a completely customized treatment plan unique to your ultimate goals. If you’d like to learn more about the many ways I can help improve the appearance of your face and cheeks, please contact Carolina Facial Plastics today.